Westcountry Pacific 'Launceston' | Launceston Then! 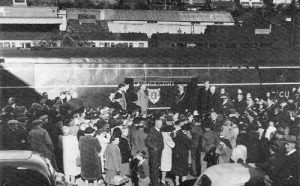 The Southern Rail West Country and Battle of Britain classes, collectively known as Light Pacifics or informally as Spam Cans, were air-smoothed 4-6-2 Pacific steam locomotives designed for the Southern Railway by its Chief Mechanical Engineer Oliver Bulleid. 21C112, Westcountry class Pacific, ‘Launceston’ was built in October 1945, and was officially named at Launceston railway station on November 1st, 1945. 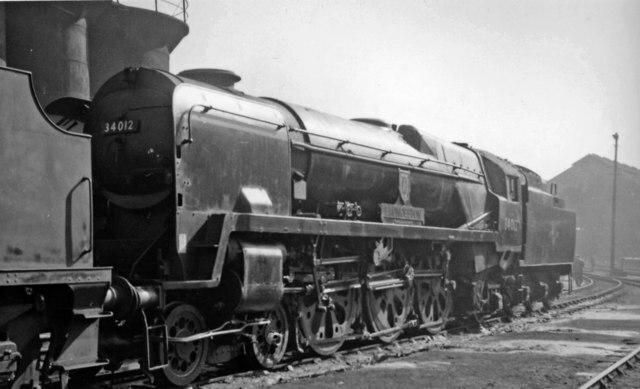 With the nationalisation of the railways in 1948, ’21C112′ was given the British Railways number of 34012. The cab was modified in February 1951, and was rebuilt in 1958, when the tender was cut down after it had covered just over 1/2 million miles. It was withdrawn from service in the December of 1966 having covered a total of 847,523 miles in its life. It was sold to John Cashmore, Newport in South Wales and was scrapped between April and June 1967. ‘LAUNCESTON’ WITHDRAWN FROM SERVICE. The End of a Fine Steam Locomotive. Local railway enthusiasts and many other people are sorry to learn that the ex-Southern Railway steam locomotive, 34012, “Westcountry class Pacific 4 – 6 – 2 “Launceston” has been withdrawn from service. There were 66 of these fine engines in this class, each weighing 86 tons and they were to be seen working express services from London to the Kent coast (where “Launceston” spent most of its life, until these lines were electrified), to Bournemouth and Weymouth, also to Exeter, North Devon, and North Cornwall lines. Latterly they were confined to the Bournemouth line (where our railways correspondent last saw it), but this line is to be electrified on July 10. Named after many Westcountry places, these included in this area: Bude, Wadebridge, Padstow, Tavistock, Okehampton, Bodmin, Dartmoor, Tamar Valley, Yes Tor, Camelford, Boscastle, Callington, Brentor, Hoslworthy, Calstock, Bere Alston and Lydford. 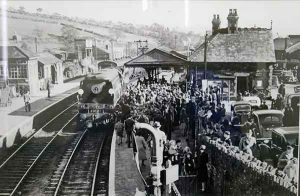 “Camelford” made a little bit of history on November 29, 1965, by hauling the last normal steam train working between Salisbury and Exeter. It too, is now withdrawn. “Callington” hauled the last steam “Bournemouth Belle” on December 31, 1966.